Dog lovers unite! Chewy carries everything you need for your lovable pup all available at the click of a mouse. Spoil your best friend with only the best in dog supplies for dog food, dog treats and dog toys. 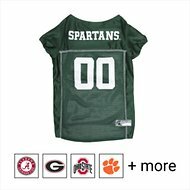 If you've been searching for michigan state spartans dog clothing & accessories, look no further. 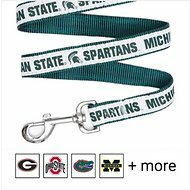 Among the wide selection we carry, one option to try is Pets First NCAA Dog Leash. Key benefit: displays your team's colors so everyone will know which team you're both rooting for. 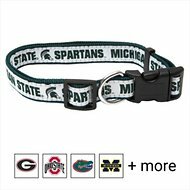 Another product is Pets First NCAA Dog Collar. Key benefit: each size collar adjusts to give your pet a secure yet comfortable and snug fit. Whatever it is you're looking for, Chewy has got you covered. Shop our wide selection of dog supplies today and treat your pupper to a box of new goodies. 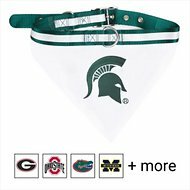 For all your pet needs including michigan state spartans dog clothing & accessories, Chewy has you covered! We're here for you.